"Great action with a lively cast of flesh-and-blood characters, engaged in real-world relationships and embroiled in a risky crisis that gets resolved through the hero’s courage, integrity, and thrilling exploits. Highly recommended!" The Columbia Review. “Legacy of the General,” the fourth installment in T.W. Anderson’s “A Reluctant White Knight” series, pulls the hero, Tom Rowter, and his wife, Sunny, into a complicated conflict between powerful forces and launches them on a hazardous mission to fulfill the last wish of an admired friend (i.e., the General). With the fourth novel in the series, Mr. Anderson maintains the remarkable qualities of his creation, while fleshing out the main characters, expanding the family circle, and revealing new aspects of this evolving saga. “Legacy of the General” picks up a short time after the events of “Seascape’s Aground!” (Vol. 3). The story begins with a few scenes that give the reader—even a new reader—a sure footing in what’s happening in the lives of Tom and Sunny. Meanwhile, a mysterious outfit gears up to take violent action in order to pilfer possession of ‘an item,” which happened to be on its way to Tom posthaste, courtesy of his now-deceased friend. Soon, the suspense rises and bad things start to happen. Mixing in the successful ingredients that made the previous volumes so enjoyable, the author adds in legal wrangling, government conspiracies, IRS and CIA shenanigans, a former U.S. president, and a good measure of sprightly romance and lively action. As before, Tom Rowter, with the conflicted yet incredibly gutsy Sunny, is determined to do the right thing, come hell or high water—or such other bad things as one might expect, either on the ground or in the air. 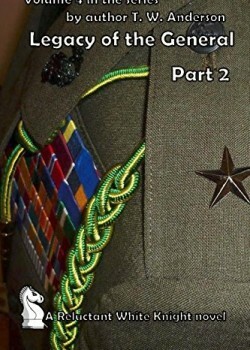 In summary, “Legacy of the General” fulfills the promise of the series, delivering an authentic setting and great action with a lively cast of flesh-and-blood characters, engaged in real-world relationships and embroiled in a risky crisis that gets resolved through the hero’s courage, integrity, and thrilling exploits. The ending, when it comes, is surprising and satisfying. Highly recommended!